More than three dozen of America's wealthiest individuals and families have joined Bill Gates and Warren Buffett in agreeing to give away at least half their fortunes to charity. The announcement was made Wednesday by The Giving Pledge, an effort officially launched by Gates and Buffett earlier this year to persuade the richest people in America to commit to giving the majority of their wealth to the philanthropic causes and charitable organizations of their choice, either during their lifetime or after their death. 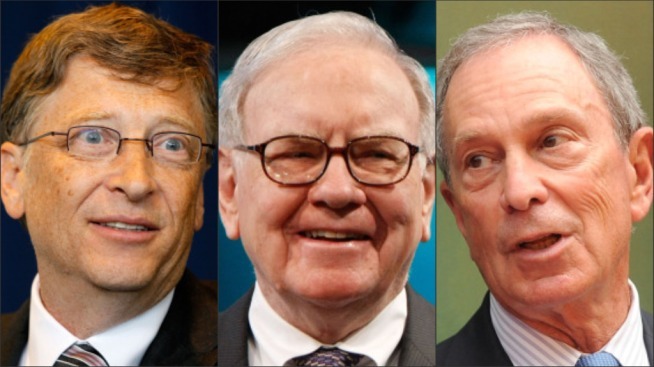 In addition to Buffett and Gates — America's two wealthiest individuals, with a combined net worth of $90 billion, according to Forbes — 38 other billionaires are taking the give-it-away pledge. They include New York Mayor Michael Bloomberg, entertainment executive Barry Diller, Oracle co-founder Larry Ellison, energy tycoon T. Boone Pickens, media mogul Ted Turner, David Rockefeller, film director George Lucas and investor Ronald Perelman. "We’ve really just started, but already we’ve had a terrific response,” Buffett, co-founder and chairman and CEO of Berkshire Hathaway, said in a statement. “At its core, the Giving Pledge is about asking wealthy families to have important conversations about their wealth and how it will be used. Gates and Buffett launched "The Giving Pledge" in June. The effort could funnel a colossal amount of money into nonprofit groups. If the individuals on the Forbes 400 list of richest Americans pledged half their net worth to charity, that would amount to $600 billion, according to Fortune magazine. The United States has roughly 400 billionaires, about 40 percent of the world's total, according to Forbes. The pledge is a moral commitment to give, not a legal contract. It does not involve pooling money or supporting a particular set of causes or organizations.